Colorstreams features the best of Color Healing Radio, launched in 2009 by Aura House School of Color and Light to promote clarity, healing, and peace through the use of Color. The great Peacemaker Mahatma Gandhi once said: “There is no way to peace. Peace is the way.” Do you want to share your Light to help bring peace to the planet? Join host Eleyne-Mari Sharp for a New Year’s Eve encore broadcast of music, meditation, and manifesting. On this last day of December, we will welcome the Silver Violet Flame and learn how to achieve inner peace by heightening our vibrations of Love and Light. We will also learn how to manifest our positive intentions for the New Year. If you live in the Northern Hemisphere, you know that the season of Winter begins this year on December 21, the shortest day and longest night of the year. The Winter Solstice welcomes the return of the sun while allowing us to appreciate its darker gifts of reflection, releasement, and peace. To mark this magical occasion, color therapist Eleyne-Mari Sharp guides you through a half-hour ceremony that includes a crystal meditation in the dark, candle lighting, affirmations, journaling, and bell ringing! November is the month of Thanksgiving. Are you feeling grateful? Or do you have a list of grievances a mile long? In this episode, host Eleyne-Mari Sharp talks about the palette of Thanksgiving, Gratitude Jars, and the blessings of the color Gold. *Use your own clear quartz crystal or focus on a crystal in the image at rainbowpodcast.com. Sometimes nothing in this great big world of ours makes sense. Are you having trouble finding Peace amidst the chaos? In this episode, host Eleyne-Mari Sharp reflects upon the color (and gemstone) that helped her heart heal, following the attacks on September 11, 2001. She also talks about grief and how the colors of the sea can help you through your sorrow and disbelief. *Use your own clear quartz crystal or focus on a crystal in the image below. **You will need a smiling photo of you or your loved one before your illness or loss. Are you ready to treat yourself to a great summertime adventure? In this episode, host Eleyne-Mari Sharp helps you manifest your own Color Camp. She also explains how to create an emergency Color First Aid kit and write insightful postcards to—and from—your Higher Self. *Use your own clear quartz crystal or focus on a crystal at www.rainbowpodcast.com. How many times have you stopped what you were doing to admire a rainbow? In this premiere episode, host Eleyne-Mari Sharp talks about the benefits of working with this legendary symbol of hope and introduces you to her favorite stress-relieving color. The Worldwide Didgeridoo Meditation is a global event celebrated four times a year during sunset on the equinoxes and solstices. Created by Didj Shop, the Worldwide Didgeridoo Meditation “helps people re-connect with nature, earth energy and each other in a very strong and harmonious way.” WITHIN RADIO is proud to participate in this worldwide celebration! Hosted by Eleyne-Mari Sharp, this broadcast features 45 minutes of didgeridoo music and a 15-minute silent meditation. "2-4-6-8…what do we appreciate? Color! Color! Yay...Color!" Can you believe that Color Therapy Month is here again? To promote this 8th annual worldwide event in March, founder Eleyne-Mari Sharp hosts a Color Pep Rally to introduce you to this year's Varsity lineup of Color Therapy Month team players. You know them as the Rainbow Rays: Red, Orange, Yellow, Green, Blue, Indigo, and Violet! Enjoy 30 minutes of Peace with color and crystals! The great Peacemaker Mahatma Gandhi once said: “There is no way to peace. Peace is the way.” Do you want to share your Light to help bring peace to the planet? Do you want to learn how to achieve Inner Peace by heightening your vibrations of Love and Light? Join host Eleyne-Mari Sharp as we honor ourselves…and the world…with the gift of Peace…through a guided meditation with color and crystals. GUEST: Dougall Fraser is a psychic and cosmic life coach, based in Los Angeles. He was born with the ability to see and "read" color energy and offers color courses on his website, including Building Your Rainbow Bridge and Color is My Prozac, Dougall has appeared on The Dr. Phil Show, The Real Housewives of Orange County, and Dancing with the Stars. He is the author of the bestselling book, But You Knew That Already: What a Psychic Can Teach You About Life. 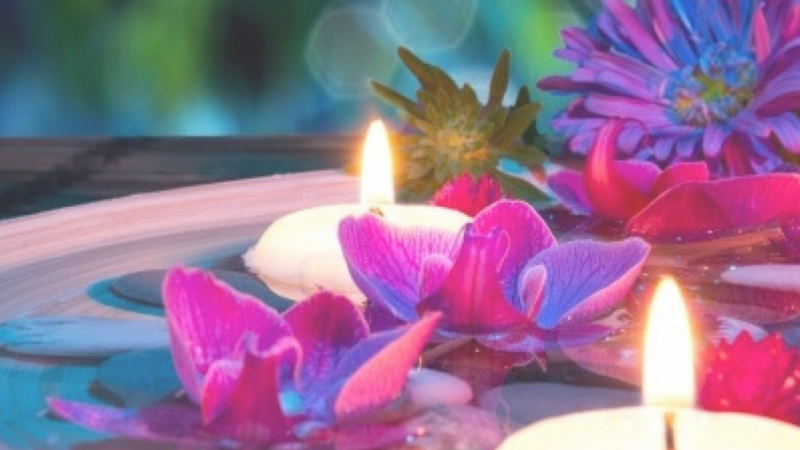 Color therapist Eleyne-Mari Sharp leads this guided meditation for the New Moon to help manifest peace, love, and healing through color visualization. Can we raise our vibration, simply by listening to a specific type of music? And how do flowers soothe our soul? In this episode, host Eleyne-Mari Sharp continues her sound healing discussion with prolific artist/musician/author Jill Mattson, talking about flower essences, toning, channeling, and Ascension. Have you ever heard of a musical CD embedded with the frequencies of uplifting emotions, flower essences, and 12 crystals? In this episode, host Eleyne-Mari Sharp welcomes prolific artist/musician/author Jill Mattson to discuss sound healing with crystals, the music of water, and her new Crystal Realms CD. Julie Tallard Johnson is a licensed psychotherapist who maintains a private counseling and consultation service. Julie is the author of 11 books (including Spiritual Journaling) and facilitates spiritual journaling classes and workshops for writers and others with creative and spiritual pursuits. Michelle "Shelley" Hanson is a seashell wisdom expert, teacher and the author of two books, Ocean Oracle and Ocean Wisdom. She teaches her "Ocean Speake" certification classes online. Bonnie Snyder is an educational psychologist, Authentic Happiness coach and certified Life Balance and energy alignment coach. Bonnie is the author of Angel Violet's Magic Wings, a storybook tool for young children and their parents. Carla Golden is a licensed massage therapist and spiritual nutritionist. She teaches how to use food as a platform for spiritual growth. Those who are healing from physical or emotional trauma can use Carla's unique "Fruit Til Five" and "The Healers Diet" plans to bring their body and soul into greater vibration, health, happiness, and peace. Writelighters is a movement, a Universal intention to help manifest positive change through the written word. This program showcases conscious writers who are actively using their words to encourage wellness, peace, and positivity to elevate the vibration of the planet. In this episode, host Eleyne-Mari Sharp welcomes Marie Lukasik Wallace, a writer, poet and writing workshop facilitator from Boise, Idaho. Marie will talk about her life as a conscious writer, the launching of Poets for Peace, and reads her thought-provoking poem, "Rockabye." Want to make the world a happier place? Start with yourself. In this special episode of "Lightmovers and Shakers" with host Eleyne-Mari Sharp, spiritual teacher Hope Fitzgerald introduces us to the gift of the Infinity Wave, a new energetic union of Love, Life and Self. "Wave energy is the movement of a higher dimensional frequency," says Hope. "It breaks up and dissolves duality, clearing the way for a co-creative dance with life." By using this channeled energetic tool, the Infinity Wave will smoothly navigate you through uncharted, potentially stormy waters, putting to rest the old belief that deep change takes much time and suffering.